Things get complicated when the real world seeps into games. Some players don't like it, because it ruins the whole ‘escapism' thing. And developers can come under fire for inserting agendas or politics that players don't agree with. Here's the thing though: there's no such thing as an apolitical game and thinking otherwise can be dangerous. Yesterday I sat down with the new SimCity, where I learned that always-online play means that Maxis can watch how you play. That's not new; developers like accruing player information to access the efficacy of the game design and to refine future titles. What's interesting about this is that Maxis will be looking at global player trends in order to create special challenges for players. Asking about this further, I found out that these challenges will also be created to mirror real-life scenarios, and tackle real-world issues. On cue, the Maxis PR representatives clarified that there's no underlying agenda or political stance that SimCity will push on players. There are only player-determined approaches to problems, and Maxis will try its best to present balanced options. That's noble, but not realistic or possible. The thing about games is that they're abstractions of actual things. To code something, to include something at all in a game is to define how it works. Maybe that seems obvious, but there are implications that come with how systems in games are defined—particularly so for simulation games, which aim to define society. There is no mechanic or system out there that does not carry politics with it: it's just a matter how how visible those politics or agendas are. Depending on what's included or shown, we can glean the developer's stances about race and gender, amongst other things. Maybe they don't feel a race or gender is important enough to include, for example—typically, there will be excuses surrounding time and tech, but these are flimsy when you take a look at the superfluous things a developer does decide to include instead. Or maybe there's the uncomfortable implication that Caucasians are, as far as the game is concerned, actually more important than other races—and that's why there's more options for them. Every single one of these things carries politics with it: and we're not even in the hypothetical game proper yet. Nothing explicit had to be said, and worst of all, it's almost invisible if you don't stop and think about it. I'd go so far as to say it's worse than not outright forcing a stance on players because it's insidious. Nothing explicit had to be said, and worst of all, it's almost invisible if you don't stop and think about it. I'd go so far as to say it's worse than not outright forcing a stance on players because it's insidious. "By 1970, competition from overseas and other economic factors pushed the once "automobile capital of the world" into recession. Plummeting land values and unemployment then increased crime in the inner-city to chronic levels. You have 10 years to reduce crime and rebuild the industrial base of the city." Where are race and class, two of the crucial aspects in that situation? Not even present in the game code, that's where. That hasn't changed in the new SimCity. I say this not to skewer Maxis, but to posit the idea that there are always powerful socio-economic factors at play that may be absent in a simulation. This is important to realize as we continue to push for games' potential to serve as a positive educational tool—developers must strive to be cognizant of what they include, and what it implies. To be sure, I ask for this because of my own personal agenda—which aims to be more inclusive and progressive—but there's a tangible benefit for the gameplay, too. Taking into consideration aspects of a scenario that are tricky, like race, can make for simulations that are richer and more complex. Hopefully, that can create a simulation that better mimics the situation at hand. 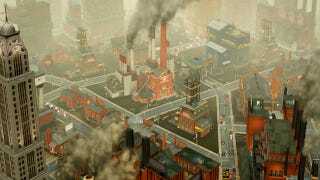 Should SimCity take a particular stand? I don't think there was ever a choice.